It's not always easy for hearing aid users to communicate with others, particularly in noisy environments. This can really be frustrating and limit your social interaction, for instance during an interview or when out with friends and family. 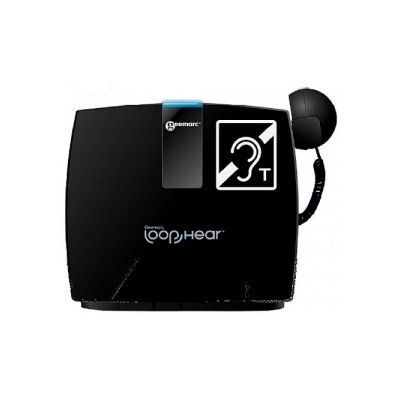 The Geemarc LoopHear LH-101 Portable Induction Loop is a portable unit designed for facilitating communication between a speaker and wearers of T-coil hearing aids. This device is ideal for situations which involve one-to-one interaction, for instance at service counters, railway stations or banks. The useful unit comes complete with a lightweight case, induction loop, a built-in amplifier and an external microphone and earpiece. It also includes an additional earpiece for non-wearers of hearing aids or those who don't have the T position. Make conversing with others easier with the Geemarc LoopHear Portable Induction Loop! Where Can the Geemarc LoopHEAR LH-101 Portable Induction Loop Be Used? Click the PDF Icon below to download the user manual for the Geemarc LoopHear LH-101 Portable Induction Loop.